Opened by Dr Alan Wade (Chiropractor) in 1972, Bays Chiropractic has grown into a multi-doctor practice. The practice was originally based in a small cottage but in 2008 we built a brand new, purpose built clinic with our own x-ray facilities. 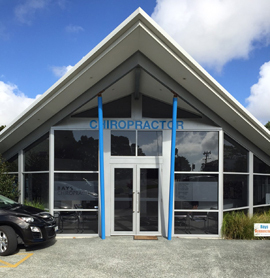 In our modern, spacious and vibrant office, we offer techniques and services to suit a wide range of patients from Auckland’s North Shore area. We investigate, diagnose, treat and prevent pain and impaired function in the joints and muscles. More precisely, we look at the body’s biomechanics. Our comprehensive examination includes looking at your joints, bones, tendons, muscles, nerves and connective tissue to give us the best possible insight into your problem. Our chiropractors are able to provide chiropractic care for many different people and conditions. We’re able to see families, babies, children, the elderly and those with sports injuries. One of our chiropractors also has a specialised table designed specifically to treat disc herniation, disc protrusions and prolapses as well as sciatica. In addition to chiropractic care, massage therapy and acupuncture are both offered at our location. The most commonly treated conditions in a chiropractor’s office are back pain and neck pain. After all, 85% of all New Zealanders will suffer incapacitating lower back pain in their lifetime. A high percentage of those with back pain lasting more than two weeks will go to a chiropractor. At Bays Chiropractic, we have made a specialty of resolving difficult cases of neck pain and back pain, as well as offering a full programme for holistic and wellness healthcare.